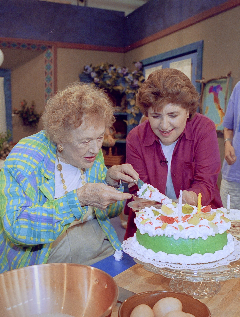 Julia Child would have been 100 years old on August 15. She was born in 1912 and I always remember her birthday because mine is in August too and that was a reminder for me to send her a birthday card. She was such a lady that she would send me a return typed postcard thanking me for remembering her birthday. invited her to stop by the studio and film a little cooking segment on frittata. She happily agreed! It is no secret that Julia thought that Italian cooking was not a serious cuisine. It had so structure, no rules and no unification. On the other hand, French cuisine was regimented, organized and had standards. She was the queen of the kitchen and even though I did not agree at all with her, I was thrilled to have her in my kitchen! So Julia, a towering and unassuming person with a mesmerizing voice settled into the TV surroundings and was ready to cook. The plan was for her to do the commentary as I whipped up the eggs for the frittata. We moved along nicely during the taping and compared how the frittata and her beloved omelet were made and how they differed in their preparation. As I gingerly whisked the eggs, I asked Julia if there was anything special she would have added to the eggs and without hesitation she suggested a little bourbon! That took me quite by surprise and elicited a deep belly laugh from me. After the taping we surprised her with an elaborate Sicilian Cassata cake filled with pistachio cream and ribboned in pistachio fondant. We sang happy birthday in Italian; Julia blew out the candles and a round of photos was taken. If she were still with us today, I would gladly make that frittata all over again, adding the bourbon as she suggested. She will always be the queen of the kitchen. I have been looking for a recipe I learned from my mother but I can't seem to find it anywhere Would you know it Ingredients: crabs hard shelled 1 can purée in sauce ,then I add the blue crabs( cleaned of course). I don't know if this is accurate ,so please let me know if you know of this recipe Thank you. Del. I have not heard of this recipe but maybe some of our web friends have and can respond. This sounds like simple crab sauce that we eat around our place all the time. We at least have it once a year at Christmas when we do the traditional 7 fishes. Someone always asks for crab sauce. It's just like a simple Marinara but you add the crabs and cook them towards the end of cooking time. I think that's the recipe you're talking about.